During the last days one Naumann’s Thrush, Turdus naumanni, continues to stay at Kihnu, Parnumaa. This thrush is obviously one of the few records for the Western Palearctic (only the 20th record might be too pessimistic) and has been observed on the island of Kihnu in the Gulf of Riga in Estonia. The bird was found around the Kihnu lighthouse. Kihnu lighthouse situates on the most southern tip of Pitkänä. A nice report of the twitch you see in an article Finnish Birding: MEGA! Naumann´s Thrush in Estonia 19.11.2012. On Wednesday, 21st of November, the bird was still on the above mentioned location. The thrush was not the only bird on the island. At the same day a Pine Grosbeak could be observed, too. 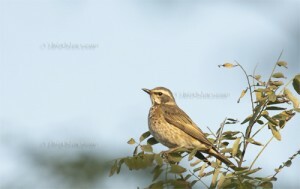 Naumann’s Thrush is a split from the Dusky Thrush and is a regular winter visitor of north-east China and Korea. The images shot on Happy Island – see blog – fit perfectly in that pattern. In his „Handbuch der Vögel Mitteleuropas“, Band 11/II „Passeriformes, Turtiidae“ Urs N. Glutz von Blotzheim mentioned that this thrush has its main distribution in middle east sibiria. Up to 1988 Urs N. Glutz von Blotzheim counted 21 observations for the middle Western Palearctic and notes at least 7 records for Poland and 8 proofed records for Germany – some from the preprevious century. Even the Netherlands had 2 observation records at that time of publication that book. To cope with the growing demand for top shots of the rarer species of the Palearctic Bird-Lens is keen to enrich the range of pictures of birds you can find in the western palearctic. Beside the image above you can find a nice selection of birds in the gallery or in the “Pictures Shop” very soon. Just give a message, if Bird-Lens could serve you with an image needed before the new pictures are online.